It was few years ago, one of our family friend told me that she never buys store bought pizza, but makes it at home from scratch to avoid all the added fat that comes with it. She assured me that I will never try to buy the greasy store bought pizza once I start making my own. That gave me the confidence to give it a shot. Since then I made pizzas of my own with variations that skews my mood. 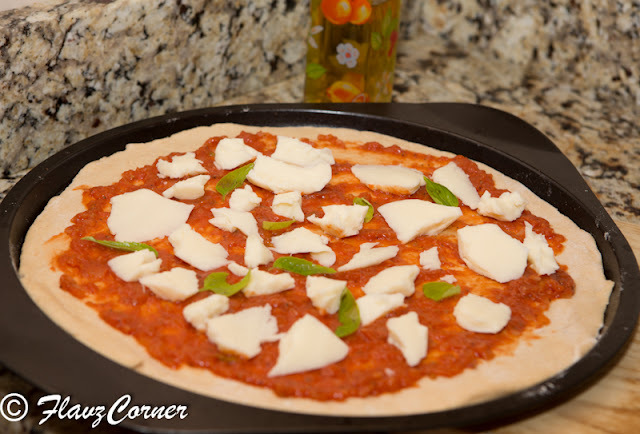 Cheese pizza is one of the pizza Moms can try prudently for kids. That being said, my kids are no exception. They too love cheese pizzas. They are not fond of thick crust. 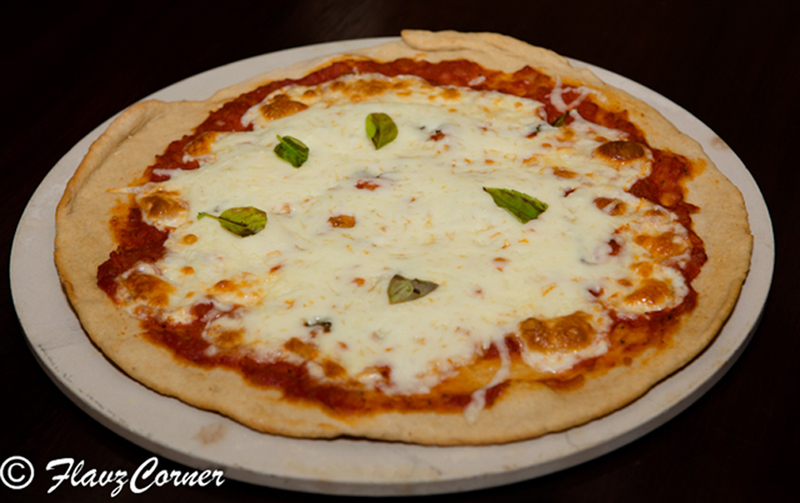 So I always make thin crust pizzas and they gobble them up in minutes. Lately, I started involving them to assist me in making dinner, and rolling the dough is their main act of glee. Even though they leave a big mess for me to clean up, I let them get involved in the kitchen to understand the exertion that goes behind each dish that appears on the dining table, which might help them not to waste the food and grumble less. This might be totally my perception, but it is worth a try. Nowadays, soon after their homework, they inquire "What are we having for dinner and who is the assistant today?” They seemed to take it seriously lol!!! 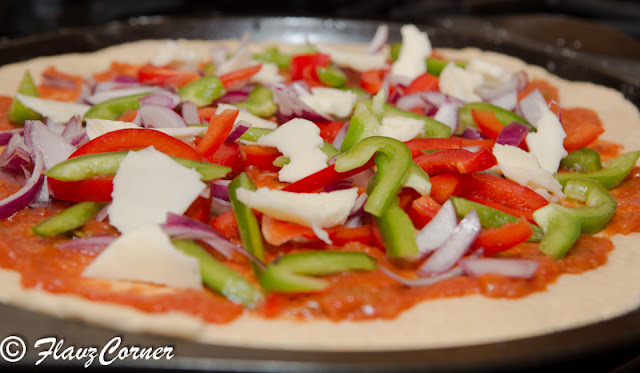 I usually make 2 pizzas with this recipe, one with Cheese and the other with vegetable toppings for us with less cheese. The following picture depicts how I assembled our vegetable pizza. Mix yeast in 1/4 cup warm water with sugar and salt and let it stand for 10 minutes or till frothy. Knead the rest of the ingredients for the dough with the yeast to make a soft dough. Transfer the dough to a olive oil coated bowl, cover and keep in warm place to rise for 1 hr. Once the dough is doubled, punch it down to release all the air and divide into 2 balls. Dust the baking / pizza pan with flour and keep aside. Dust some flour on the rolling surface and Roll out the dough into the shape that fits your pizza/baking pan. Poke holes on the base using a fork and spread 1/2 cup of the pizza sauce on it leaving a little space around the edges. Top it with 1 1/2 cup of shredded cheese mix or cheese chunks. If you are using cheese chunks, place them evenly on the base not too close, as they will spread when subjected to heat. Bush the edges with 1 tsp of olive oil and sprinkle some kosher salt on the edges. Place the basil on the top of the cheese and bake the pizza for 8 - 10 minutes till the cheese is completely melted. Repeat the above steps with the remaining dough and the toppings to make the second pizza. You can used all purpose flour instead of wheat flour. The texture of the crust is different when using wheat. If you are using store bought pizza sauce, adding crushed garlic (roasted in olive oil) and some basil will give a nice flavor to the sauce. I prefer cheese chunks than the shredded cheese because they seem to work well with cheese pizzas. Don't try to reduce the amount of yeast, you will end up with a chewy crust. Brushing the edges with olive oil will help to make it crunchier and golden brown. If you are using vegetables, sprinkle some kosher salt and drizzle 1 tsp of olive oil on the vegetable mix and rub well before arranging them.